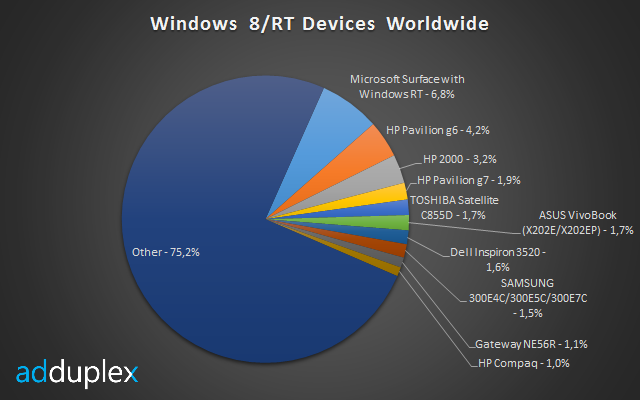 Keep in mind that AdDuplex's stats aren't an accurate breakdown of Windows device sales. The firm runs a cross-promotion network for Windows and Windows Phone apps, so the stats are just a measure of how many devices have run apps that accessed the network. In other words, if a user doesn't run any Windows Store apps with AdDuplex advertising—or doesn't access the Store at all—that user doesn't get counted. Surface RT is popular, but the most-used Windows 8 devices are cheap notebooks. The Surface Pro pen: Innovation at its most plasticky and inoffensive.